People talk about the results that would be possible if the culture were just right, and they complain where they see people’s attitudes and behaviour affecting performance. But if your organisation is like most others, the talk masks a kind of resignation – it’s ‘just the way things are around here’. It’s easy to talk – what’s rare, however, is recognition of the fact that great leaders explicitly manage the culture of their organisation. If you understand this, you will recognise the need to consciously design ‘the way things are around here’, manage it into place and measure, monitor and review it for ever. Then you will use all that wasted time and hot air on making your business outstandingly successful, and producing results which are a reflection of a culture which is anything but resigned. Every credible organisation, like yours, has a set of tangible, measurable, and objective results to produce. Different kinds of organisation will have different kinds of results, but in business they always include profit and cash. The state of your organisation’s results displays its prevalent culture. We’re not talking just about long-term results; we’re talking about results in every period – including this quarter, this week, today! Where there is a shortfall in results, there is always a shortfall in culture. If you look for the cultural shortfall and resolve it, your required results will be easier to produce. Take the example of a company who generally managed to reach its quarterly, half-yearly and annual targets, but always only by the skin of its teeth and a frantic last-minute dash to the finish line. Early in every result period, there was a prevailing feeling that ‘there’s plenty of time’, and a disinclination to be held to rigorous forecasts on a daily, weekly and monthly basis. They felt it would be OK, because they had a lot of ideas ‘in the pipeline’, and were confident they could recover later. But the weeks raced by, and suddenly it was ‘that time’ again! Through rigorous examination of the culture that was driving this stressful pattern, they decided to challenge this behaviour and instead to build and develop a culture of, ‘we deliver on our commitments, regardless of the circumstances’. Nowadays they put in place rigorous business forecasts and measure and monitor their progress towards them. More accountability from the start, which can feel like hard work at first, has saved them hundreds of hours of urgent reactive work and untold stress in the panicky ‘will-we, won’t-we’ dash at the end of every year. Culture change hasn’t happened until different results are produced! Some groups are very keen to address their cultural issues, and in these groups we sometimes see the same issue from the opposite point of view. People celebrate a wonderful ‘breakthrough’ in culture. Relationships are repaired and teams are built – hooray! Surely, breakthrough results are on the way? Don’t count on it. Unless your new breakthrough is immediately demonstrated in tangible, measurable, and objective results, it has not been tested and will fade into memory. The time and resources you have spent on the culture change will have been a waste of money. While there might be a new possibility and a lot of excitement, these don’t add up to a new, long-term, sustainable culture. The reality is that the organisation’s results still reflect the former culture. If early attempts to alter results are met with resistance in some way, then the work of culture change is not complete, and the enthusiasm for change will be blunted or killed entirely. So to answer our opening question, not only can culture change affect your business results, it must! Until your key results have changed to reflect your new culture, and you have demonstrated that you can consistently and sustainably deliver the new level of performance, the hard work of changing your organisation is not complete! 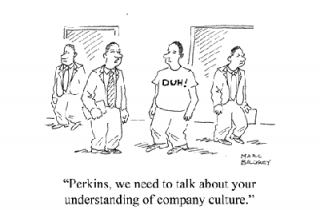 What culture is reflected in your current business results? If you’re not happy with your results, what needs to change in the culture? What measures will you put in place to initiate the necessary change?